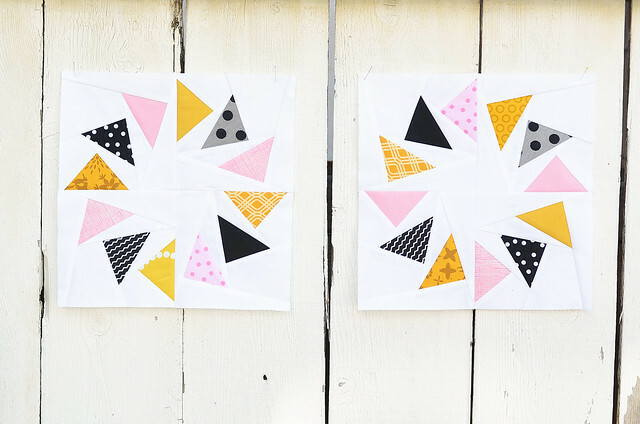 This month Caitlin asked us to make Colorwheel Geese blocks in pink, black, and mustard with a white background. Despite looking a little intimidating, these were actually pretty simple to paper piece. Caitlin asked for us to make at least one block, but two would be appreciated, and making two blocks was really not that much more work. This quilt is going to be so pretty; I really love Caitlin's aesthetic and she always chooses blocks and colors that wonderfully outside of my norm. I highly recommend taking a look at her blog! 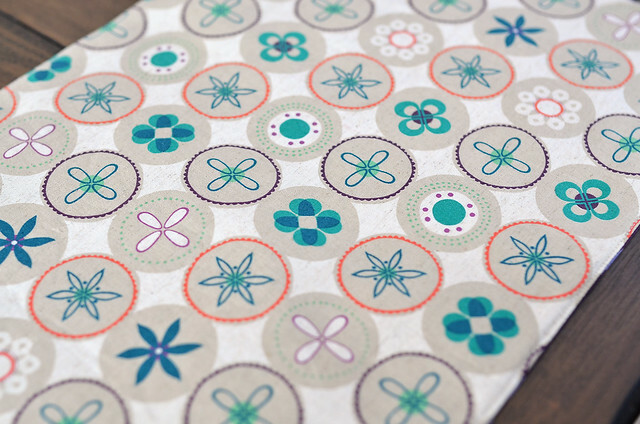 I also recently made some placemats. To be honest I was dreading making them, but I couldn't find any reasonably priced placemats in the store so I went for it anyway. I wanted to keep them simple and I did not want to have to bind them so I used this tutorial except I ended up not quilting mine. Well, I quilted two of them and then I decided I preferred them unquilted so I ripped out the stitches. Using a beloved print (it's from Melody Miller's Ruby Star Spring) definitely made working on these more fun. I have been holding onto this print for a while. I love that the fabric has a linen texture and uses lots of my favorite colors without overwhelming my husband and his distaste for teal. 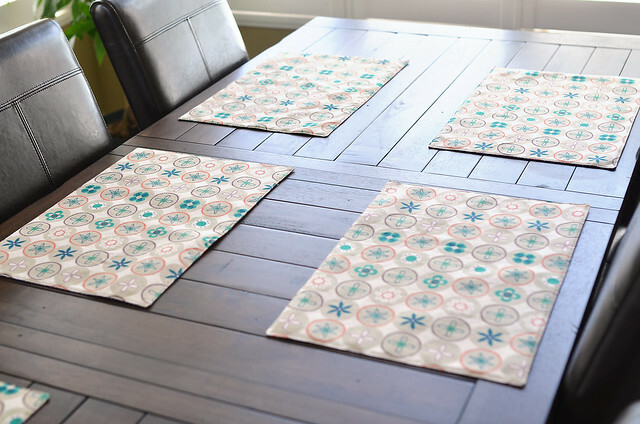 I only had enough fabric to make 6 placemats which was unfortunate since there are 8 chairs at the table, but we rarely have more than couple people over and my kids have their own placemats anyway. The backing is a purple Marimekko print that I bought out of the remnant bin at the Crate and Barrel outlet. Their remnants only cost 99 cents a pound so this fabric cost almost nothing. They have already survived a few uses! I love the circle of geese! I really must make some. 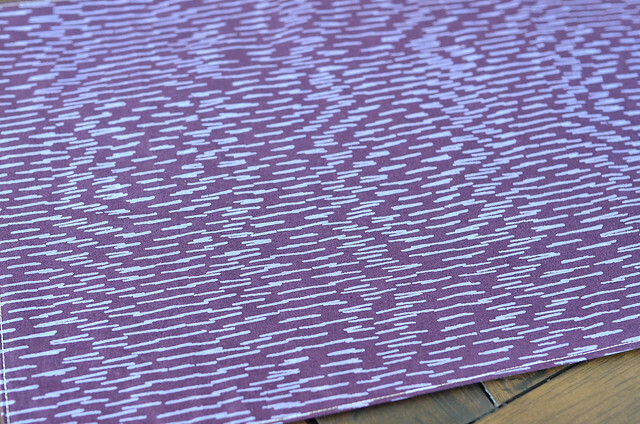 Your placemats looks so cute on your table! The circle of geese blocks are so pretty, I love the combination of colours. I love those flying geese blocks! so cute. I am seeing them pop up in lots of sewing, and different sizes. A nice versatile block. Your blocks are so gorgeous. Thank you! Another great idea! Totally going to make them this summer. Thanks Erica!